William Joseph Casey was a lawyer with a long and distinguished career in business and public service who later became the controversial director of the Central Intelligence Agency (CIA) during the Reagan administration. Casey was born March 13, 1913, in Elmhurst, New York. He received his bachelor's degree from Fordham University in 1934, did graduate work at the Catholic University of America, and then entered St. John's University Law School, graduating with a bachelor of laws degree in 1937. Following his admission to the New York state bar he moved to Washington, D.C., to work for the Research Institute of America, a private organization involved in analyzing economic and political data concerning the New Deal. During World War II Casey served with Army Intelligence and the Office of Strategic Services (OSS) and, from London, directed the activities of OSS spies. After the war Casey returned to Washington, D.C., and served for two years as special counsel to the Small Business Committee of the U.S. Senate. He remained interested in international relations as a result of his wartime activities, however, and in 1948 he returned to Europe to become associate general counsel for the Marshall Plan. Following his war-related service, he started practicing law and became a partner in a large New York law firm. He also began teaching at New York University, where he lectured on tax law from 1948 to 1962, and taught periodically at the Practicing Law Institute. While practicing and teaching, he wrote a number of highly successful books on taxes, real estate, and investments, including Tax Shelter Investments (1952) and Accounting Desk Book (1956), and a book on U.S. history titled Where and How the War Was Won: An Armchair Guide to the American Revolution (1976). The profits from his books, in addition to his income from his law practice and his investments, helped to make him a multimillionaire. In the 1960s, Casey moved from business to politics, running in 1966 for a seat in the U.S. House of Representatives. Though he lost the primary to a more conservative Republican opponent, Casey remained active in the Republican Party, writing and conducting research for Richard M. Nixon's 1968 presidential campaign. In 1969 he helped the new president set up the Citizens Committee for Peace with Security, which was organized to back Nixon's policy on antimissile weapons, and served on the advisory council of the Arms Control and Disarmament Agency. In 1971 Nixon appointed Casey chairman of the Securities and Exchange Commission (SEC), where he quickly became known as a tough administrator who favored strict regulation of stockbrokers. Casey also became unpopular with his fellow Securities lawyers when he named them as defendants in connection with their clients' alleged frauds. While head of the SEC, he persuaded Congress to increase the agency's budget by $1.5 million, which he used to hire more lawyers, accountants, and other specialists to improve the agency's efficiency. In 1974, Casey moved from the SEC to the State Department, where he served as undersecretary of state for economic affairs for two years. He then became president and chairman of the export-import bank, an independent government agency charged with facilitating the export of U.S. goods and services. In 1976 he left government to return to private law practice in New York and Washington, D.C., though he did return to accept an appointment to President Gerald R. Ford's Foreign Intelligence Advisory Board. "Affinities between the profession of law and intelligence-gathering [include] confronting the paradox of being at the same time seekers of truth and partisans in a cause." In 1981 Casey embarked on what was to be the final and most controversial chapter of his career when President ronald reagan appointed him director of the CIA. 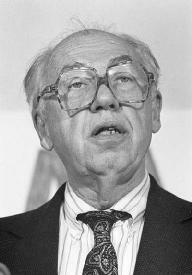 The nomination was criticized by some members of Congress as blatantly political because Casey had run Reagan's 1980 presidential campaign. Nevertheless, Casey eventually won congressional approval and became the first director of the agency to be given cabinet-level rank. Known for his hard-driving and sometimes confrontational management style, Casey won early praise for improving the CIA's analytical work. But he also drew heavy criticism for the agency's political activity outside the United States when the CIA stepped up its support for anti-Communist organizations in developing countries. Under Casey the agency engaged in intelligence operations in Central America, where it mined Nicaraguan harbors and provided textbooks for the Nicaraguan contras (the rebels fighting the Marxist government of Nicaragua) on how to use violence against civilian officials. Congress, angered by reports of the operations, voted in 1984 to make aid to the contras illegal. When a diversion of funds to the contras from arms sales to Iran came to light—in a scandal that became known as the Iran-Contra Affair—Casey denied that he had any knowledge or involvement of such sales. Critics charged that as CIA director, Casey should have known about the affair, and suspected that Casey had played a larger role than he acknowledged. In addition, members of Congress criticized Casey for allowing CIA staff members wide latitude to circumvent the prohibition against giving aid to the contras. Casey was to testify before a Senate panel about the CIA's role in the sale of arms to Iran in December 1986 but became ill and was hospitalized the day before he was to appear. He then underwent surgery for removal of a malignant brain tumor and it was also reported that he was suffering from prostate cancer. In February 1987, after several weeks in the hospital, Casey resigned his post at the CIA. Later that spring congressional hearings on the Iran-Contra Affair commenced. The first witness, retired Air Force major general Richard V. Secord, testified that Casey was involved in providing arms to the Nicaraguan rebels after Congress had outlawed such activity. However, the nature and extent of any involvement by Casey remained unclear. On May 7, 1987, Casey died of pneumonia. Casey's death left many unanswered questions about the Iran-Contra Affair. However, both Republicans and Democrats praised Casey for his patriotism, intellect, and commitment to public service.